Kathryn Morrison was born in Madison. She studied business administration at UW-Madison, earning her M.B.A. in 1965, and then taught economics at the UW-Platteville before running for political office. 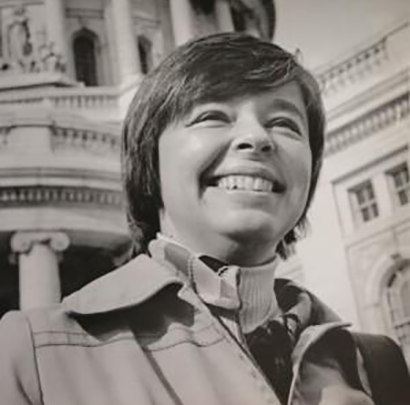 Morrison, a Democrat, was elected by the state’s 17th senate district in 1974, defeating Republican incumbent Gordon Roseleip, who opposed women’s rights. During her four years as senator, Morrison made progress toward improving the status of women in Wisconsin. One of her greatest accomplishments was to help pass a “no-fault” divorce law. She also fought against efforts to weaken a gender equality bill that passed in 1975. In 1976, Morrison became the first woman to join the legislature’s influential Joint Finance Committee. When she lost the 1978 election, she went on to work for the federal government under President Jimmy Carter, in the Department of Health and Human Services. In 1983, she became administrator of the Wisconsin Division of Health. Later, she served in top leadership positions in the New York City Health and Hospitals Corporation and the March of Dimes. Halsted, Gilman. “Kathryn Morrison, First Woman In State Senate, Passes Away.” Wisconsin Public Radio, July 2, 2013. http://www.wpr.org/kathryn-morrison-first-woman-state-senate-passes-away. Uebelherr, Jan. “Katie Morrison was first female member of Wisconsin Senate.” Milwaukee Journal Sentinel, July 17, 2013. “Morrison, Kathryn M. Kate.” Madison.com, July 6, 2013. http://host.madison.com/news/local/obituaries/morrison-kathryn-m-kate/article_fc1b8071-f09d-572c-a32d-5f1a21cc050b.html.